This is just in. Apple has just dropped iOS 9.3.2 beta 1 for download on compatible on iPhone, iPad and iPod touch devices. This release comes less than a week after Apple released a bug fix update in the form of 9.3.1 firmware to public late last week. Apple’s release notes for iOS 9.3.2 beta 1 only mentions bug fixes and under-the-hood performance improvements as changes in iOS 9.3.2 compared to previous iOS 9.3 and iOS 9.3.1 releases. If we spot any other changes, we will update this post with info on them. iOS 9.3 was released last month shortly after Apple’s March 21st event, bringing in many new features such as Night Shift, password/Touch ID protected Notes, CarPlay enhancements and much more. 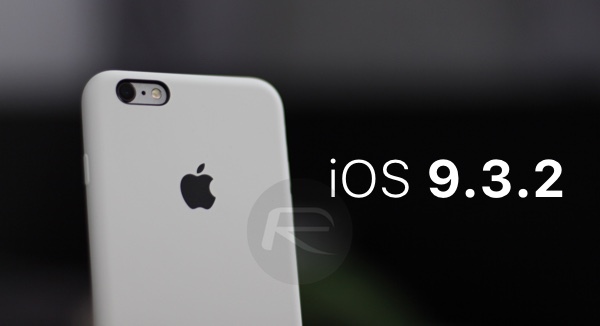 After the initial release of iOS 9.3 was botched with critical bugs, Apple released iOS 9.3.1 late last week with fixes in place for all compatible iPhone, iPad and iPod touch devices. Yesterday, Apple stopped signing iOS 9.2.1 firmware, making downgrades from both iOS 9.3 and 9.3.1 to 9.2.1 impossible in the process. iOS 9.3.2 beta 1 is currently only available to those developers who are registered on the Apple Developer program both as an OTA download and as an iTunes restorable IPSW file. While iOS 9.3.2 beta 1 is not available to public beta testers as yet, it’s only a matter of time before Apple makes it available to those testers registered on Apple Public Beta program. We will let you know whenever that happens, Stay tuned for more. Update x1: iOS 9.3.2 beta 1 is now available to public beta testers. But Apple is arrogant despite having a steep decline in the products sales. See what happened with f.lux it requested users to request Apple to sideload f.lux and Apple stole it under the pathetic name called night mode. Which is not even compaitable with 32 bit devices. About the downgrade one thing is for sure Apple never supports thDespite having 7 betas iOS 9.3 had to release two more quick updates. Apple has lost in the Tim Cook era like hell. Steve jobs Apple is crucified by TIM DE COOK. is it still possable to save SHSH’s?